Make the pastry and choose the filling. There are days when I need simple and easy, there are days when I need inspiration and there are days when the chard and spinach growing on the allotment is on its last legs and needs using before fully going over to seed. Days like that need a Pie in them. 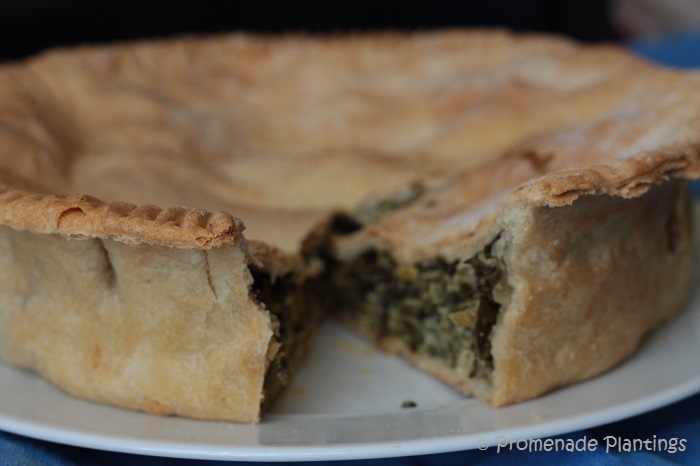 Today’s pie is from Liguria, I have no connection with Liguria, no convenient granny in the family or aunty round the corner, no tales of happy childhoods spent on the Ligurian coast, pie in hand…. I’m from Manchester and we northerners do like a spot of pie – the meat and tater kind served with a good gravy. I like the idea of portable food, food you can take places whatever the weather, a picnic pie, an allotment pie, a midday lunch at work pie, a pie for sharing. A Portable Pie. Since baking the pie I’ve read that it’s traditionally served at Easter and came across countless versions, lots with potato added to fill it out, others with rice in to soak up the juices, but I think this pie doesn’t need those additions, it’s fine and dandy as it is, it’s a pie for all reasons and seasons. First make the pastry by sifting the flour into a large bowl, make a well and pour in the olive oil and the pinch of salt, start mixing it together and add a little warm water (a bit at a time) to make a soft but not sticky dough. In the bowl with the spinach/chard mix now add the oil, cheese, eggs, salt and pepper to taste, mix it in well. Previous Post Previous post: Do you ever find yourself bursting into a sort of lunatic laughter at the sheer prettiness of things? Next Post Next post: If promenade plantings was a stick person what would she / it / I look like? A good pie always hits the spot. Your pastry looks fabulous Claire. oh wow …. this is my kind of food!! 🙂 I’d prefer hot, tho, over cold….. This looks amazing…I will certainly use this recipe when my greens are ready! It reminds me of the savory Pasty our upper peninsula is famous for…they carry those pies cold in lunches, too, or eat them hot with gravy. Thanks, Claire! you have a pastry that’s famous in your area – I need to try that Cindy! Yes, I think it is derived from the Finnish heritage of many folks in Michigan’s upper peninsula. They are a lard-based pastry crust with a filling of vegetables and meats (that vary, but turnip is supposedly a must-have for a true Pasty). They are called Pasty – with a short vowel sound, and were traditional lunch fare for the miners. Now they are a tourist-draw, and a “must-have” whenever we go north! Thank you Cindy, I find food history and cultures fascinating, and the Finnish roots of the pasty tick those boxes. Have you heard of Cornish pasties they sound a bit similar in that they were taken to work (including down the mines) too. That sounds and looks incredibly delicious. We’re about a month behind because our winter was brutal this year. A lovely looking pie and a great rollicking intro to it, Claire. My greens are still very young and full of good intentions, so will remember this when they are more mature. Gorgeous crust! I think you’d enjoy this Cathy, nice and easy and tasty. Mind you I was reading about Parmesan cheese the other day and how it has cow renet in it so isn’t any good for a vegetarian diet…. who knew?! I have a spanakopita in the oven right now! I make mine with filo–it’s quick, tasty and easy. I like it without cheese, however, I make little feta cheese puffs without any greens when I feel like indulging. Happy Nesting. A very superior and tasty looking pie Miss PP! Do hope that in the absence of gravy you accompanied it with a little glass of wine 😉 Love the olive oil pastry too. A brilliant ‘green pie’, Claire. 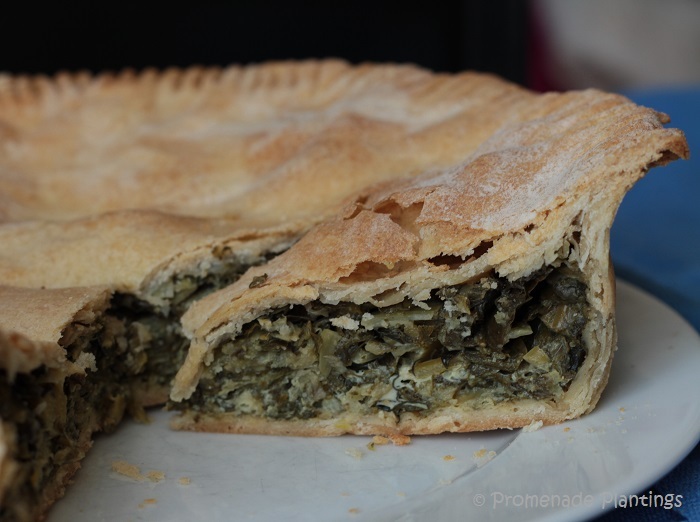 I love sweet/fruit pies but every once in a while something savoury really hits the spot and it’s a great way to use up the greens from your garden. You could always get those large ‘tart’ tins which can be cut into two. I like to cut, wrap and freeze my pies so I only have to bake once and eat several times. That looks gorgeous! Can you tell me more about the flour you use as I am not sure what strong plain flour is? I always struggle with pastry. Hi Joanna, I just use the standard supermarket flour that’s labelled strong!!! I realise you are into your baking so this is a bit embarrassing 🙂 It’s funny as I can generally do pastry and I’ve no idea why……. A portable pie. I love thinking in those terms and will now do so when I take pie to someone’s home. Evening Kathryn, now you have just taken the pumpkin version up another notch with orange juice and zest….. roll on autumn! Sounds delicious! Bet it would be good with feta cheese instead of parmesan. 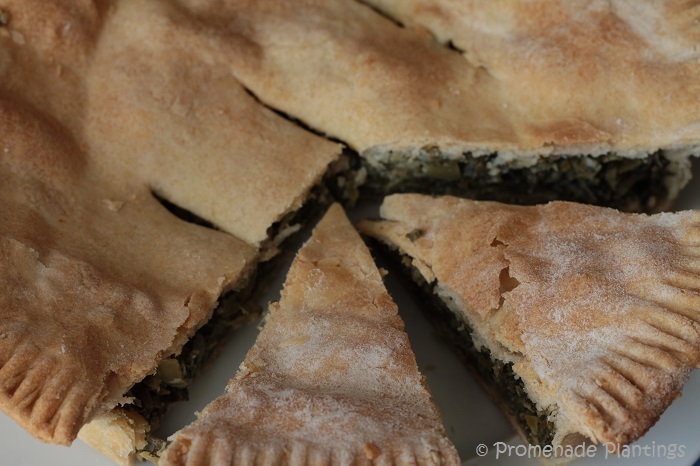 and if made with filo pastry would be great too – like spanikopita, delicious! I come from the slap dash school of pastry making, so this one is a real winner! I’ve had a similar pie with black olives added to it, other times with some chopped egg added to it so I know your pie with greens fresh from the garden is delicious. Hi Karen the addition of eggs or olives would certainly add a great taste twist, so thank you for your ideas! The pies look very good. afternoon Shimon, hope all is well with you – I hear you have a few visitors in town this week ?! Yes, right you are… and though we respect all visitors, those VIPs make it rather hard to get through town without getting stuck in a traffic jam. But we know that this is just passing notoriety. I love the sound of this really versatile green-filled pastry, Claire! I’ve never had anything quite like it, and haven’t previously envisioned eating my greens quite this way. I think you’re so correct in speaking of all the different vegetables that would round out each season. I’m quite taken with this idea. I always have more greens than I know what to do with and I do get a little tired of them sometimes. I’m so glad I didn’t miss this! I know what you mean about greens and kids! I heard about some research the other day about getting your kids to eat better food, the trick is to not tell them it is good for them but that its tasty…….. good luck Inger!! This is the perfect thing to use the chard (like Celia’s, it’s starting to bolt). I need more simple recipes for greens and this will do nicely, thank you. Well this is certainly a simple recipe Sharyn and I bet you would make a great pie crust too. My early sown spinach has bolted, the chard is fine. I can’t seem to grow an early crop of spinach – I want those young tender leaves for summer salads. I probably need to sow a lot earlier or find a reliable variety! Claire, I am from the Southern United States and we love a “spot of pie” very much. In fact I have never met a pie I did not like…some I love…some I crave…. I like making savory pies as well as sweet ones. Good recipe and story. I would add big chunks of mozzarella or feta cheese. I love a delicious savory pie and this one looks so tasty. Being in the US, we have spinach coming on now, so that is what I would use – delicious! My Italian heritage is Ligurian, (Cicagna) and my grandmother who emigrated from there made a very similar pie with olives. To this day, if I smell a fig or an olive I careen back through time to the 1960s and her kitchen. Man, could that woman COOK!! Ahhhh I can imagine the smells from the kitchen! And I will have to try the olives, I LOVE olives in all shapes and forms.